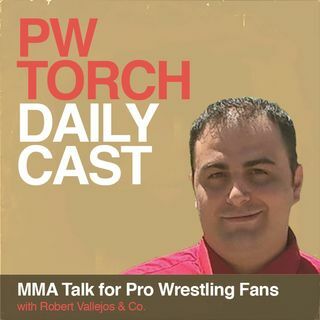 On this week's edition of MMA Talk for Pro Wrestling Fans, MMATorch.com's Robert Vallejos and Sean Covington review a loaded weekend in MMA and Pro Wrestling. They take a look back at Bellator 215 and Bellator 216. The guys break down UFC on ESPN 1, and they give their take on the biggest matches from WWE's Elimination Chamber PPV. The show closes with a brief discussion on the near future of New Japan Pro Wrestling.